Amish Malaguania Bedroom. 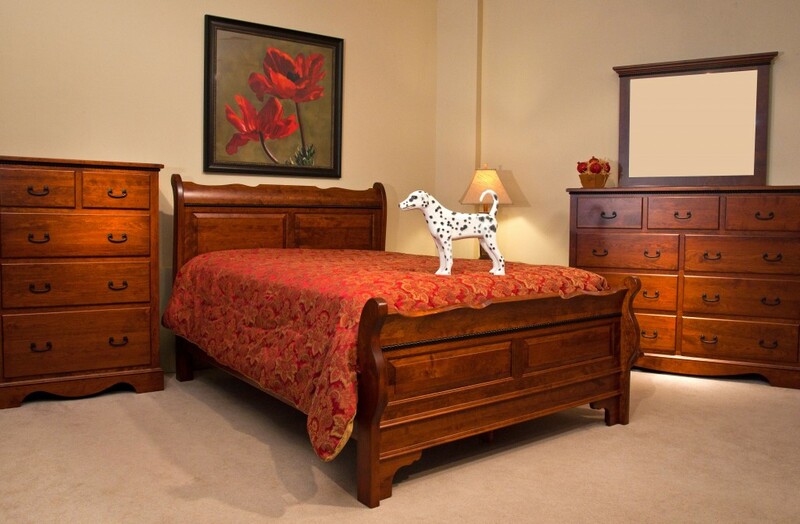 Bedroom features bold, large crown moldings on each piece as well as beautiful turned legs. Constructed entirely of solid rustic cherry for a warm feel that is sure to impress for many years. All drawers feature English dovetail box construction as well as full extension ball glides. The drawers can also be ordered in soft close glides. The brushed copper hardware featured is as bold as the group itself with it's large look and jewel-like appearance. All features of this group can be customized including wood specie, stain, hardware, and sizing. 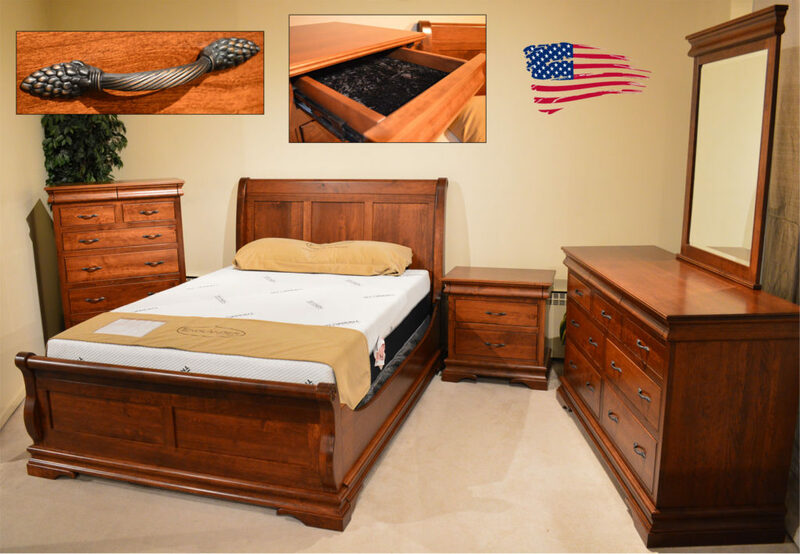 King bed is featured, but is also available in Queen size as well as platform storage for each size. Made by real Amish Craftsmen in the USA! Feel the flow of this unique Amish Bed and bedroom. Bed features high post legs and unique wave pattern rails. The bed is also available with storage drawers or King size. 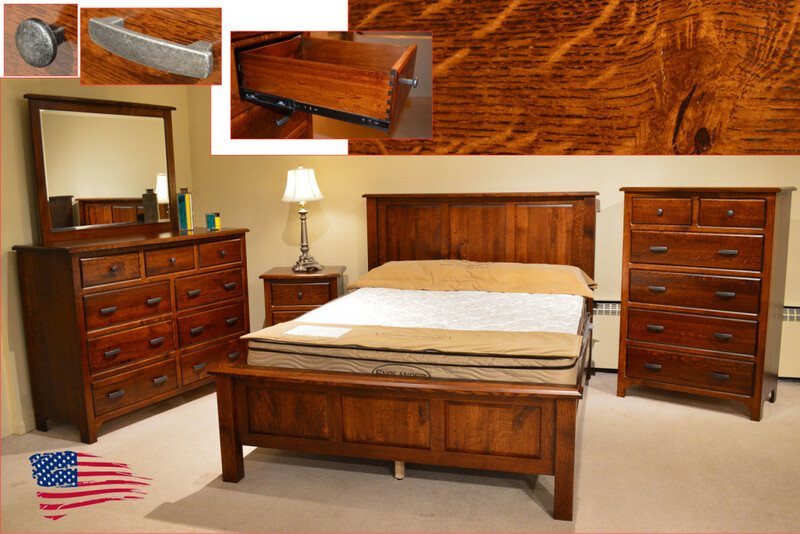 Other features include angled post legs, 1 1/4" Solid Tops, and soft close hidden drawer in the dresser. All English dovetailed drawers feature silky smooth Blum soft close glides for extra refinement and are finished inside and out. 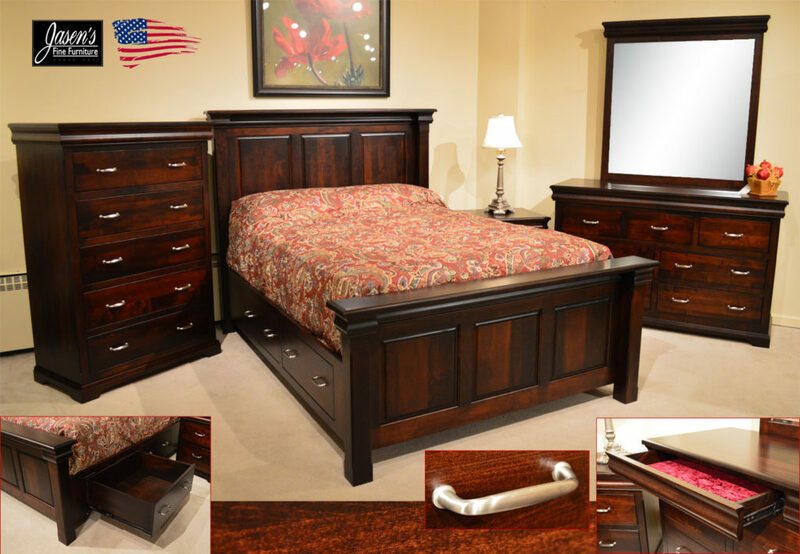 Shown in a rich mahogany stain on solid brown maple with designer hardware that is sure to impress! Can be ordered in wood, stain, and hardware of your choice to make it truly your own. Each piece can also be made to you size specifications. Made by Amish craftsmen in the USA! The bedroom features solid oak construction while maintaining a modern style. 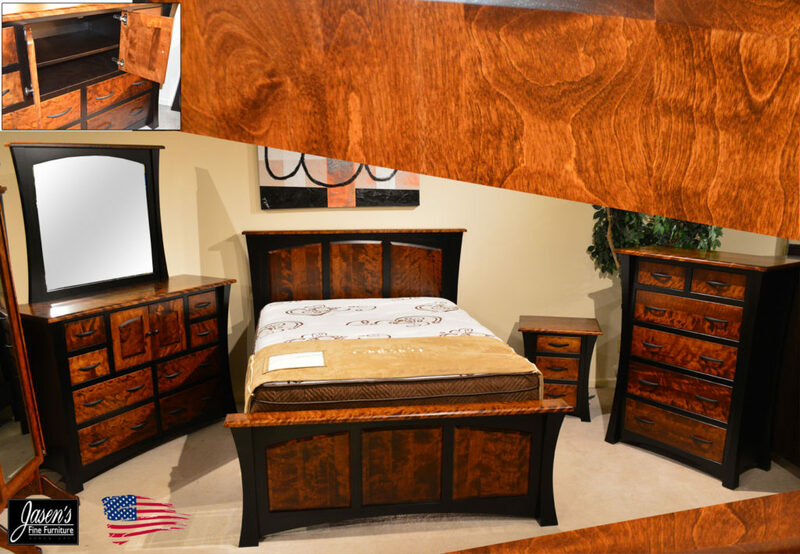 Options for the bedroom include other varieties of wood specie including maple, cherry, quarter sawn oak, and more. The stain colors for each wood species are almost limitless. Hardware that is shown on the bedroom provides extra style to the squared off look. The hardware selections are also nearly limitless. Tops on each piece have a routered channel that gives each piece an almost floating top look. 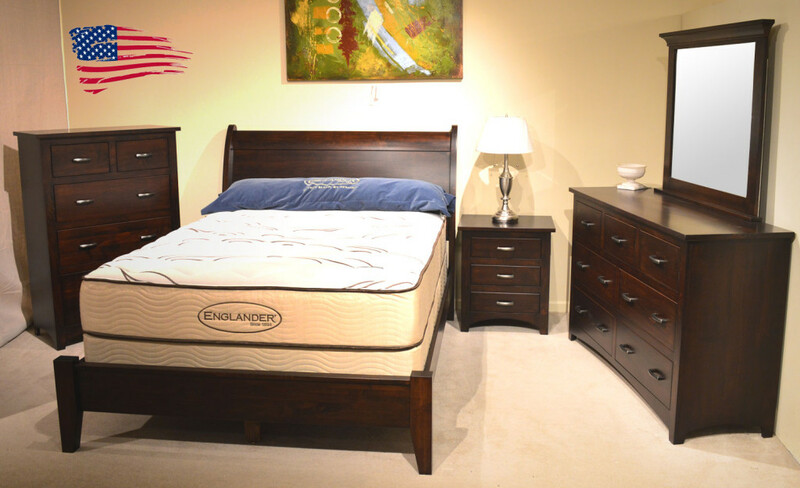 A queen bed is shown, however king is available as well as a storage platform base. Specifications for size are entirely up to you, however there are a variety of pieces available in the group. 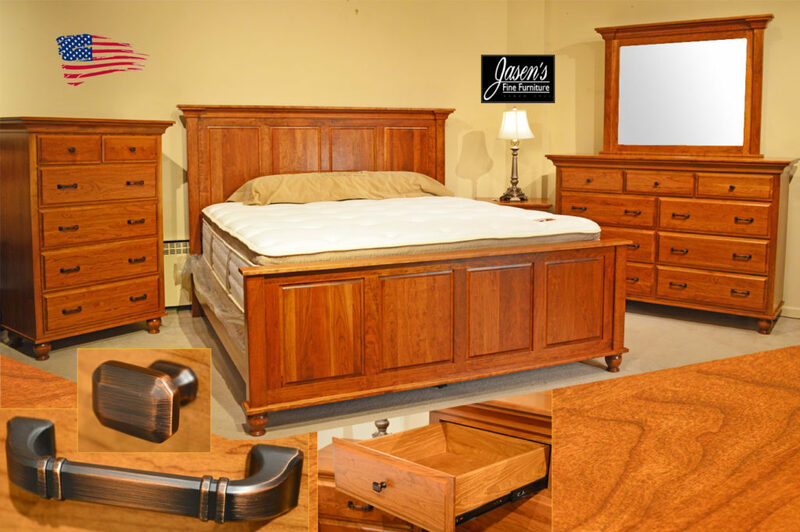 The Amish handcraft each piece to ensure that the bedroom will last almost forever. 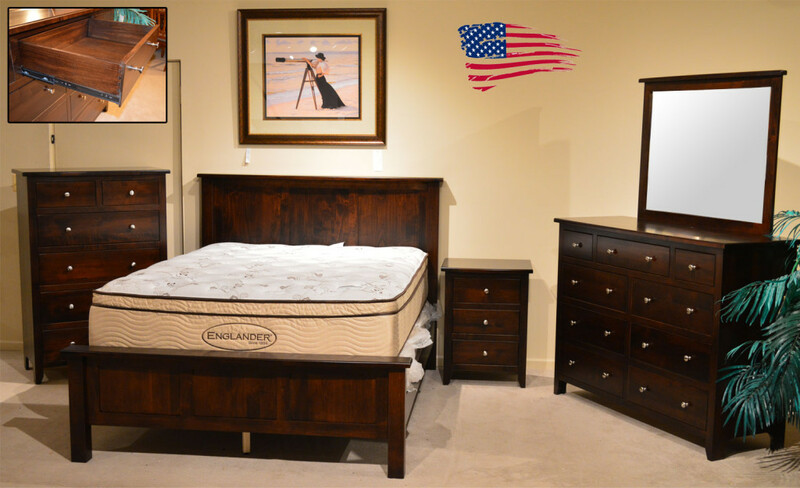 Consequently the bedroom is made in the USA! 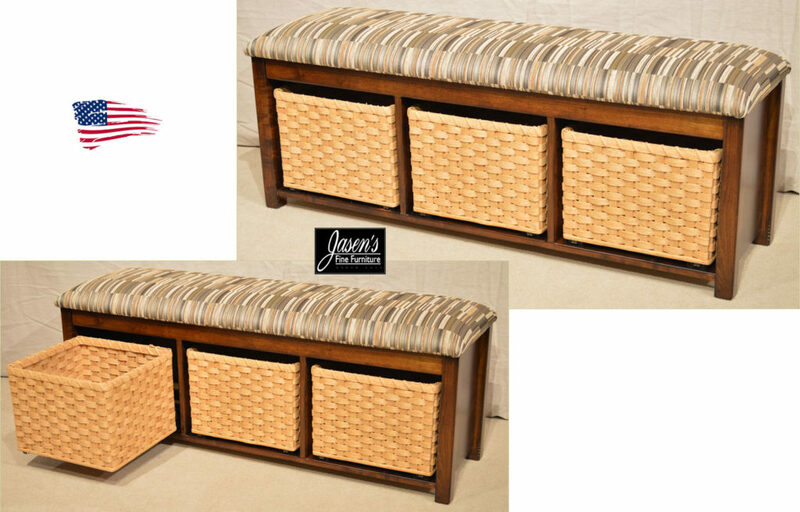 The bench has modern lines while it utilizes old world woven baskets. Baskets are on durable and consequently functional, full extension glides. Glides are mounted under the baskets to retain the charm of the baskets. The padding is included and the fabric shown enhances the weaved basket look. Fabrics to choose from for the bench are numerous to almost a 1000 or more. Solid wood construction will ensure that the bench will last for generations. 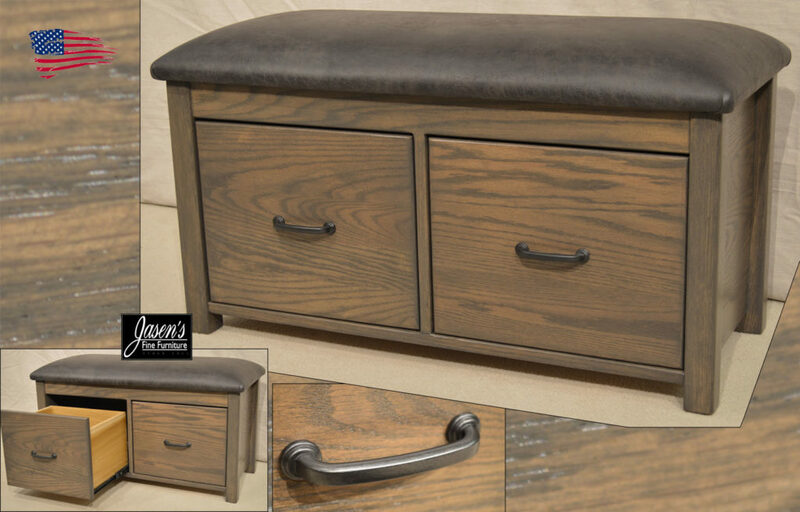 The bench is made entirely of Solid Brown Maple while shown in a timeless Tobacco stain. There are many wood specie to choose from including Oak, Cherry, Quarter Sawn White Oak, Walnut, and more! Furthermore, there are dozens of stain colors to choose from in each specie of wood. Finally, the bench is made my the Amish, hence it's made in the USA! 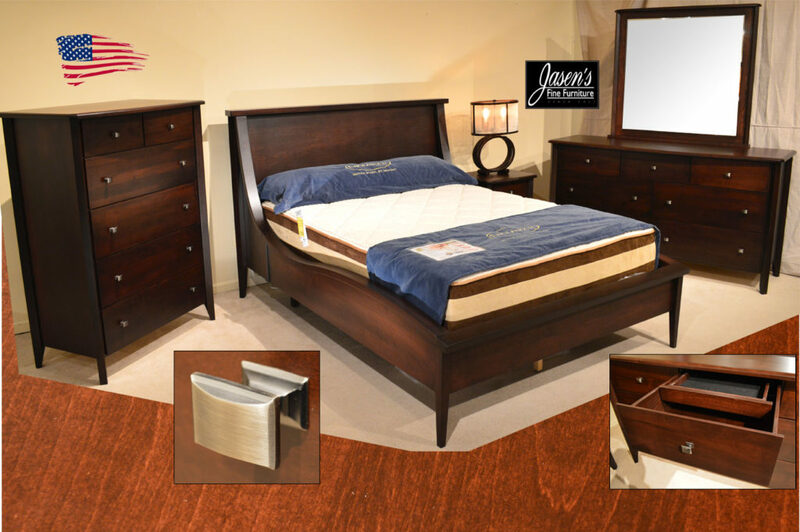 Bench Size: H-18" W-53" D-16"
The solid wood bedroom is also shown with the storage platform bed option. The bed has massive post legs and each edge has been thoughtfully routered for great detail. 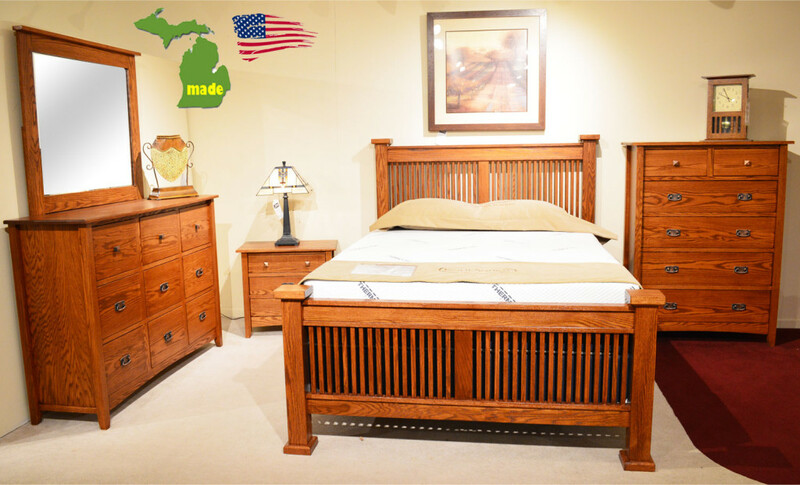 The bedroom is constructed entirely of solid brown maple, however you can order it in any wood specie you like. Besides the wood specie, you can also choose any stain color you like for your own personal touch. The drawers are dovetailed, finished inside and out, and have brushed pewter pulls. Finally, you can also pick your own hardware from an extensive catalog with 100's of styles. 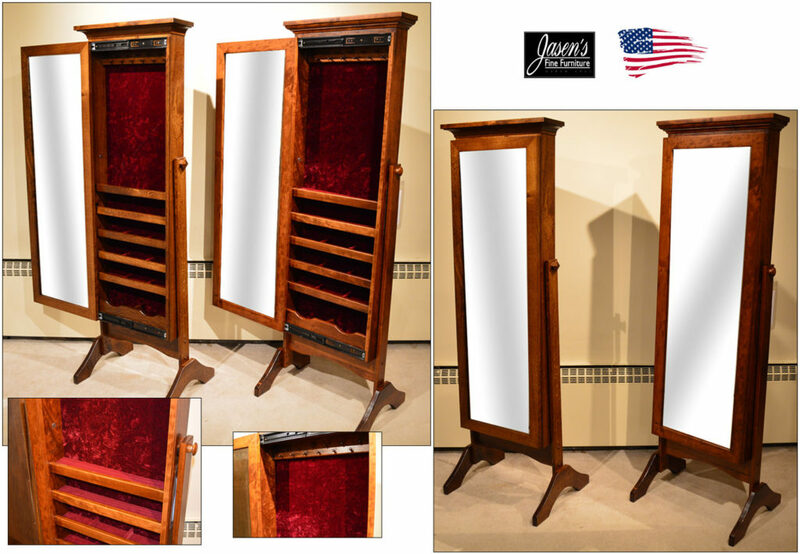 Amish Floor Mirror or Cheval Mirror features solid wood construction, beveled mirror, and adjustable tilt. Full extension glide tracks reveal abundant jewelry storage with crushed felt interior. Can be ordered in any wood specie and stain of your choice. Perfect for a gift or to accent your current Amish Bedroom furniture! Made in USA! 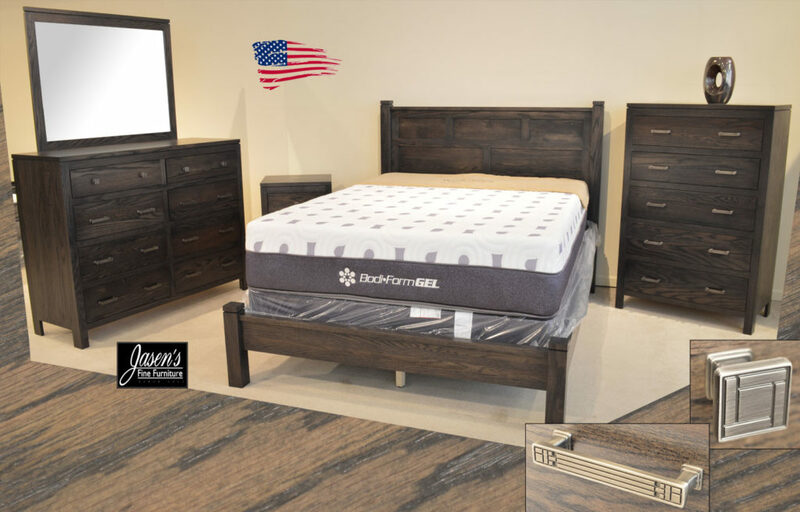 Amish Flame Birch Bedroom features aggressively curved legs, flame birch drawers and tops accented by ebony framing to lift the unique grain of the flame birch. Other premium features include full extension glide tracks on each drawer, beveled mirror, and unique door storage on dresser. Set can be ordered in a large variety of wood species, stains, hardware, all in your specified dimensions. Made in USA! Bedroom features solid post legs, clean styling, unique hardware, beveled 1.5" granite tops, full extension glide drawers, and storage drawer foot board on the platform bed. Also available in Oak and Cherry wood in a large variety of finish colors. MADE IN MICHIGAN!! Nightstand- 29.5"h * 26"w * 16"d.
Michigan Made Oak Bedroom- "Huron". ALL SOLID OAK and Plywood, roller tracks for smooth action and full access to your drawers on every piece, designed as a value set to give our customer's a great price. Also available in Maple and Cherry wood in a large variety of finish colors. 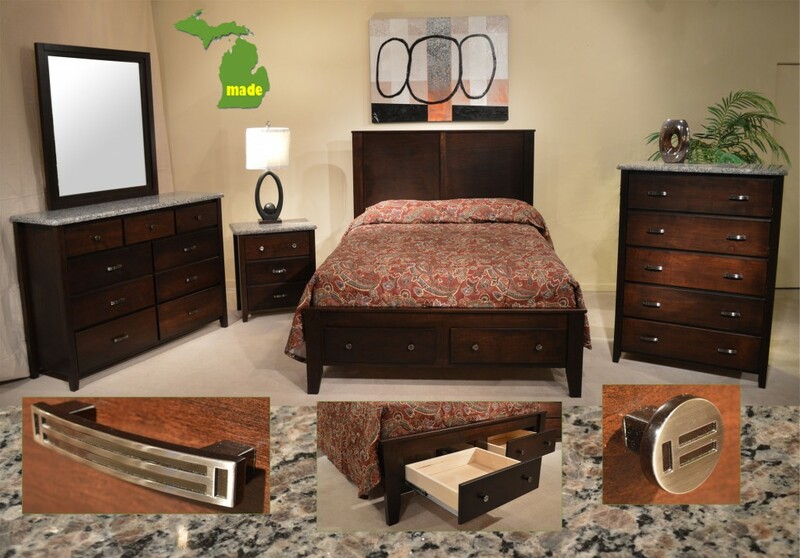 Nightstand- 29"h * 26"w * 16"d. MADE IN MICHIGAN!! Nightstand- 36.5"h * 20.5"w * 17.5"d.
Amish Oak Bedroom- "Old World". MADE IN U.S.A.!! 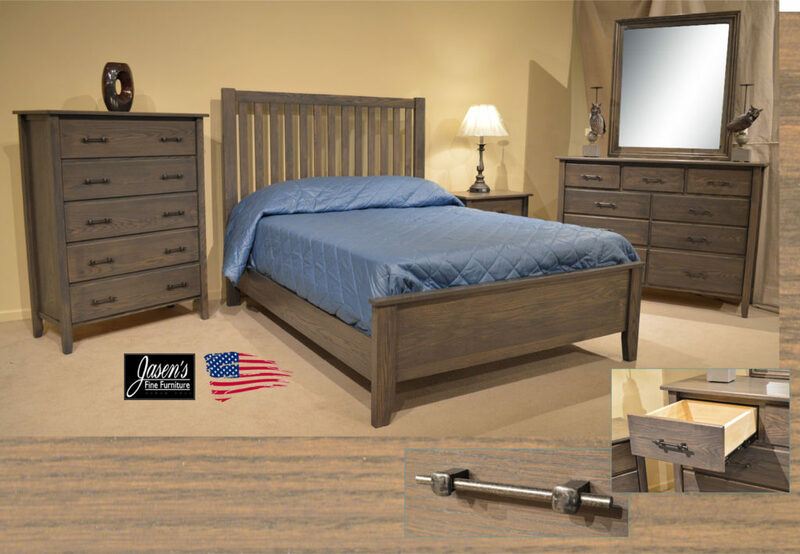 ALL SOLID RUSTIC QUARTER SAWN OAK, Aged Pewter hardware accents the beveled style of the set. Full-extension ball bearing glide tracks for silky smooth action and full access to your drawers on every piece, the finish is achieved through a multi-step process. Available in Oak, Maple, and Cherry wood in a large variety of finish colors. Nightstand- 30"h * 22.5"w * 19"d.
ALL SOLID RUSTIC CHERRY, Full-extension ball bearing glide tracks for sliky smooth action and full access to your drawers on every piece, accented with ebony rope moldings and hardware to match. Available in Oak, Maple, Quarter sawn Oak, and other species; variety of finish colors, and hardware catalog. MADE IN USA!! Nightstand- 28"h * 24"w * 18"d.
Michigan Made Oak Bedroom- "Mission". ALL SOLID OAK and Plywood, full-extension ball bearing glide tracks for sliky smooth action and full access to your drawers on every piece, and there are also concealed drawers on certain pieces... Also available in Maple and Cherry wood in a large variety of finish colors. Nightstand- 26"h * 28"w * 16"d. MADE IN MICHIGAN!! 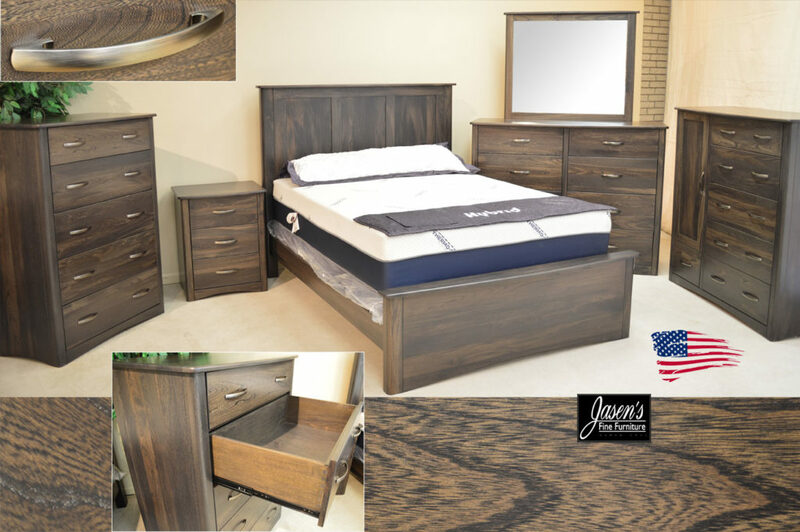 Amish Oak Bedroom- MADE IN U.S.A.
ALL SOLID OAK, full-extension ball bearing glide tracks for sliky smooth action and full access to your drawers on every piece, the finish is achieved through a multi-step process that takes many steps. Also available in Maple and Cherry wood in a large variety of finish colors.